Dog air travel is one way to transport your pet to another location, but the process takes a lot of preparation. Read on to learn the steps involved, and get some tips to help assure your pet arrives safely at his destination. Dog air travel is a lot more complicated than airline travel for humans, and these days that's saying a lot. However, sometimes it's the most convenient travel solution for your pet. There are two basic ways for your dog to travel by air. If you are traveling with your pet, small dogs may travel in carriers beneath your passenger seat on the flight. This method is ideal because you'll be able to check on your pet frequently, and your presence will help lessen any anxiety he might feel. If you're not traveling with your dog, or he is too large to fit beneath your seat, it will usually be necessary to check him in as cargo. This means he will be shipped along with the rest of the plane's luggage, although usually in a separate area with other pets being shipped, if any. Pets often become quite anxious in the cargo hold, working themselves up into a nervous frenzy. The temperature in the cargo hold is quite different than the controlled atmosphere of the cabin. In the past, dogs have died from either severe heat exhaustion or hypothermia during transport. In response to these tragic events, airlines will now only ship pets during specific times of year, and expected temperatures must fall within the airline's safety guidelines or transport will be delayed. Just as luggage sometimes disappears, sometimes dogs don't make it to their rightful destination, and such a situation can become extremely complicated. It will be necessary to purchase a USDA approved travel carrier for your dog, as the airlines do not provide them free of charge. Also referred to as airline crates, these units are made of high density plastic, complete with ventilation holes. Crates of this type are sold with "Live Animal" stickers to be affixed to the outside of the carrier to alert/remind airline staff of your dog's presence. Be sure the carrier is large enough to keep your dog comfortable. He should be able to stand up and turn around as needed. Carriers approved for dog air travel are easily purchased at major pet supply chains, and are sometimes also sold by the airlines themselves. Airline personnel should be able to help you through the booking process, advising you of regulations, and answer questions. 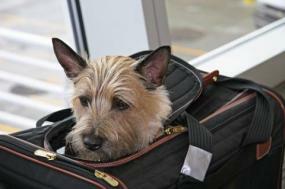 Whenever possible, try to book a direct flight to your pet's destination. Each transfer is a chance for your dog to miss his next connection, adding more travel time and stress. A carrier sitting on the tarmac while waiting to be loaded into the next cargo hold is directly affected by prevailing weather conditions, and your pet will also not likely enjoy the sound of nearby jets taking off and landing. It's far safer for your pet if you pay the higher price for a direct connection. Airlines require every dog shipped to have a current health certificate. You'll need to make an appointment with your vet to have your dog examined for overall good health and to have his vaccinations updated as needed. Keep in mind that the certificate must be dated within ten days of the expected departure time and plan accordingly. Prior to shipping, you'll need to attach the health certificate to the outside of your pet's carrier. Clear packing tape is ideal for this purpose, since it is waterproof, and the certificate will still be legible. Here are a number of useful tips that will help assure your pet reaches his destination as comfortably and safely as possible. Do not feed your pet twelve hours prior to the flight but do allow him to have water. This will help eliminate the possibility of him becoming "airsick" during the flight. Provide water for the flight. This can be done by securely attaching a water bottle to the carrier, but sometimes bottles leak or get knocked off. A better solution may be to freeze water in the snap-on cup that came with your carrier and attach it inside of the crate just prior to shipping. This will keep the water cool for a while and keep it from spilling during initial loading. Line the bottom of the crate with shredded newspaper to absorb/cover any in-flight accidents. Attach your pet's destination address to the outside of the crate, including the name and phone number of the person picking him up, as well as your own name and number for emergency contact. Be sure to put an ID name tag on your pet's collar with your home address and phone number in case he becomes lost. If possible, attach a second tag with the name, address and phone number of the person who will be picking him up. Whenever possible, try to stay and make sure your dog makes it onto the correct flight. Heightened security may render this no longer possible, but it never hurts to ask. Call the person waiting at the other end of the flight to remind him your dog is on the way, the number of the flight, and what time it should be expected to land. Dog air travel isn't easy but following these tips and guidelines will lessen the stress for everyone concerned. Dogfriendly.com provides a listing of pet friendly airlines and pet air travel policies for the USA and Canada. Pet Air is a travel agency specializing in pet transport.